Home » BK Journal by Wakako » Welcoming back someone special... with a personal tag in the mail. Welcoming back someone special... with a personal tag in the mail. A little while ago, one of my Baum-kuchen customer asked me which stamping pad is good to use to get the most out of Traveler's Notebook Star Ferry Company stamp. 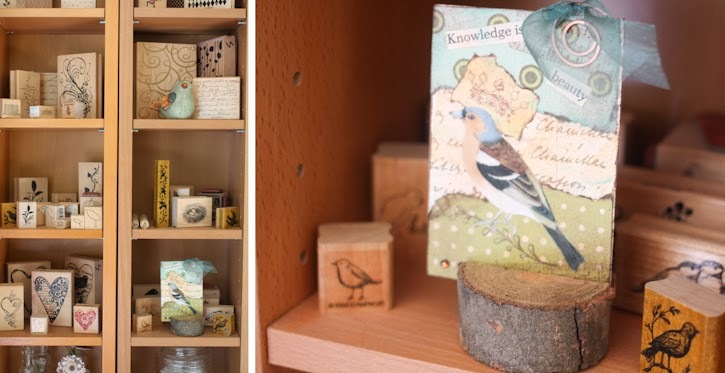 Even though I love working with analogue tools, I was not very familiar with the world of stamp... so I asked our friend Susan Kennedy who is amazingly immersed in the creative stamping culture to share one of her project as well as some useful stamping techniques. She is also at this very exciting point in her career life to start something creative, thoughtful and yummy using her special talents. You can follow her adventure through her blog The (other) Kennedy Compound. I like the process of sitting in my studio and creating “just a little something” to send to someone. It’s probably not their birthday, or a holiday, or any specific time that they might expect to receive something. It’s usually just when I’m thinking about them and I want to let them know. Email, Facebook or a texts don’t send the same message. My sister Ann is a traveler. Her latest adventure took her to Israel, where she had the opportunity to experience some amazing things. I thought it would be nice if she had a little something in her mailbox, other than bills and junk, to welcome her home. I wanted to share something that wouldn't get lost in her over flowing email inbox. Having something to physically open and touch has so much more appeal. 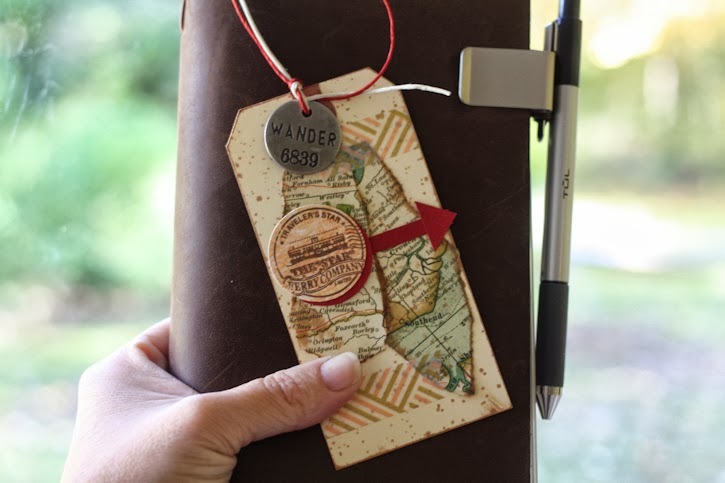 I made a small, personalized note card that captured the spirit of her travels. I'm hoping it brightens her return to the "real world". 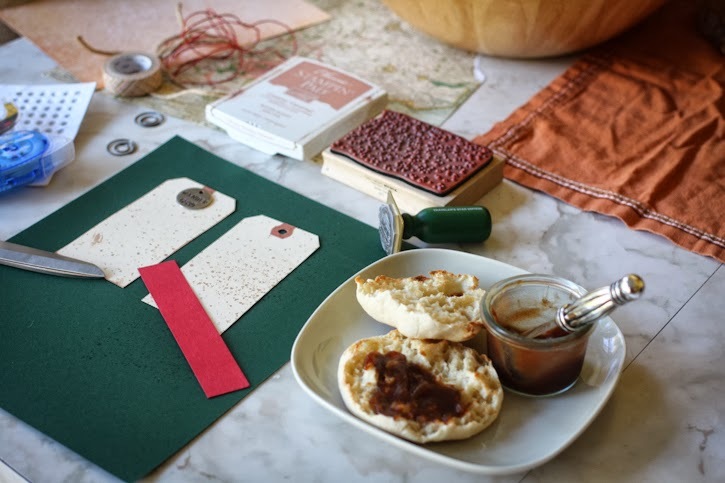 Here is some of the techniques and materials I used to make the tag card. I enjoy creating palettes with “ingredients” from my studio. 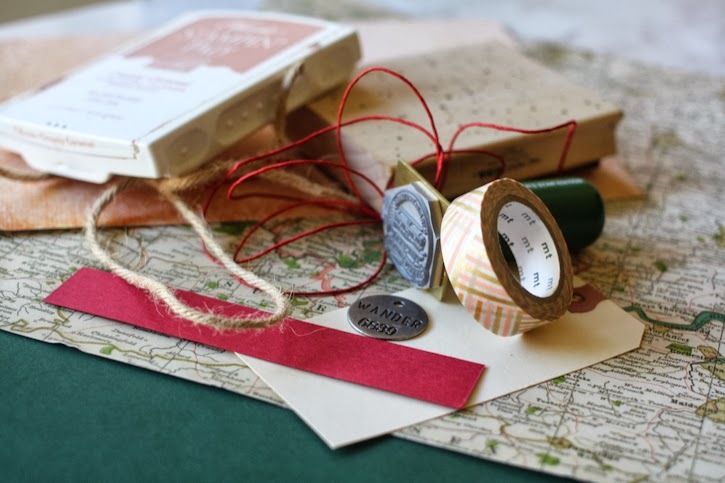 Paper, ribbons, embellishments, watercolors, pens, ink pads. I gather together things that match and sit down to create. Even when I use the same ingredients, very rarely are two creations the same. I design each piece specifically for the person that I am sending it to. Background stamps are my favorite and often the stamp that people don’t know how to use. Almost anything you do can be jazzed up with stamps, especially background stamps. They create depth and can totally change the look of something. 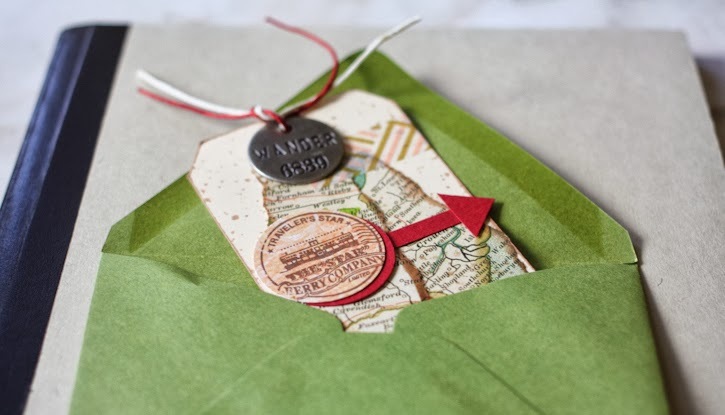 An otherwise boring, clean sheet of paper becomes antiqued or distressed giving it character with a simple background stamp. Different inks have different purposes. This website about stamping explains each type it in great detail. 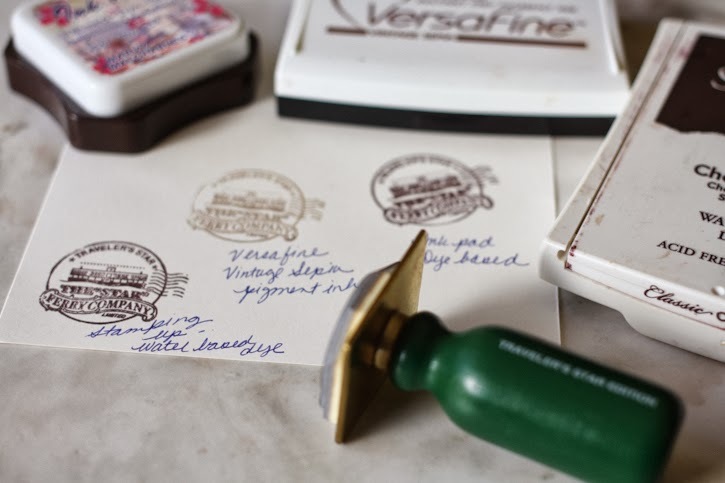 I like Versafine (crisp images) and Stampin’ Up (so many colors!). I always test stamp a few different times/kinds to get my image just right. Here you can see the difference in the stamp quality of Traveler's Notebook Star Edition Stamp depending on stamping pads used. I’ve learned to appreciate and strive for beauty + function from Baum-kuchen. 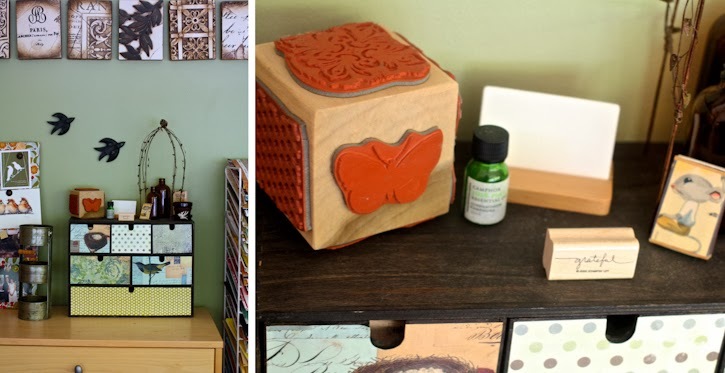 It’s inspired me in so many ways, like using my stamps (functional) as décor in my studio (beauty). 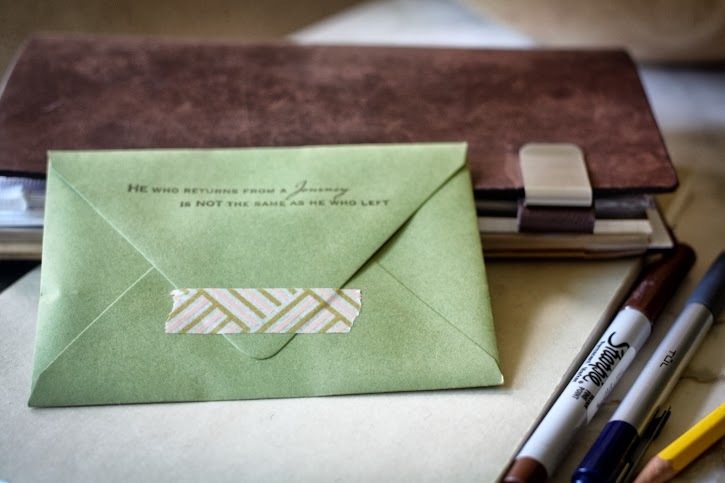 This way my favorites are always at hand, visible reminding me that it’s easy to just grab one and add a little extra something to any envelope or note. Don’t rock! It’s best not to rock the stamp back and forth on the stamp pad when inking OR when stamping image on item. Rocking will blur image &/or create “lines” from the rubber edges. “Huffing” with your breath will re-moisturize ink on a stamp. Good to know/use if your ink pad is dry or you don’t use the stamp right away. You can buy ink refills (little bottles) for your ink pads instead of buying all new ink pads. If using a large (background) stamp, ink the stamp, place it upside down on a surface, put paper on top and gently rub with your hands or a brayer to transfer the image.